Both the Olympics and the Ravelympics are over. I have to admit that I'm a bit sad. I had thoroughly enjoyed the 17 days and had never known/seen such national pride. I've never really watched much of the Olympics before, but this time I was glued to the TV and will openly admit that my TV was turned on at 9am to CTV and wasn't turned off 'til around midnight. I was so used to watching the Olympic coverage that on Monday morning I had automatically switched on the TV and was shocked and saddened that CTV was back to its usual programming. During those 17 days I had also knitted every waking possible moment. I snuck in a few rows or a few stitches here and there while the Munchkin's back was turned or while he was banging away on the pots and pans (his newest favorite activity) with his trusty wooden spoon (his newest can't-live-without toy), and had even turned down sleep in order to knit. Hell, even household chores took a back burner to my knitting. I'm just glad that I have a very supportive and encouraging partner who understands my die hard love of crafting! Unfortunately during the second week my entire household came down with a nasty cold with me getting the worst of it. I was pretty much out for the count for 2 days and could only muster up maybe an hour tops of energy to work on my Ravelympics projects. Aside from those 2 days, I was a woman possessed. I was so consumed with my knitting that I managed to get 4 FOs completed! Well, 5 if you count the frogging of the long forgotten Baby Surprise Jacket that I had started a year ago which wouldn't even fit the Munchkin anyways if I had gotten around to finishing it. At the last minute (as in right after the closing ceremony!) I decided to enter the Aerial Unwind event that requires you to frog an unloved WIP to reclaim the yarn. I had spotted the BSJ sitting at the bottom of my project basket and knew immediately that I was never going to finish it. Don't get me wrong, I love the pattern and think it's genius but I knew my attempt was a sad one and wasn't what I had envisioned. I plan on trying again in the future, but with different yarn and with better needles. Anyways, the only times that I didn't do any knitting was during the hockey games. Ok, that's a lie. I did work on my socks and cap during the Canada-Germany and Canada-Russia games after being assured that Canada was going to win those games with huge leads against their opponents. Absolutely NO knitting was accomplished during the gold medal game though. I was way too stressed out and on edge from that nail-biter of a game. I swear, I almost had a few heart attacks during the third period! I definitely burst a few ear drums and threw my hip out from sheer excitement when Sidney Crosby scored the winning goal in OT. Yes, our boys did the nation proud!! Even Brett had shed a few tears! When we arrived home after the game Brett took the Munchkin off my hands so that I could graft my socks, tie up the fringe on my woven scarf, and take a few (crappy) photos of the finished products during the closing ceremony. 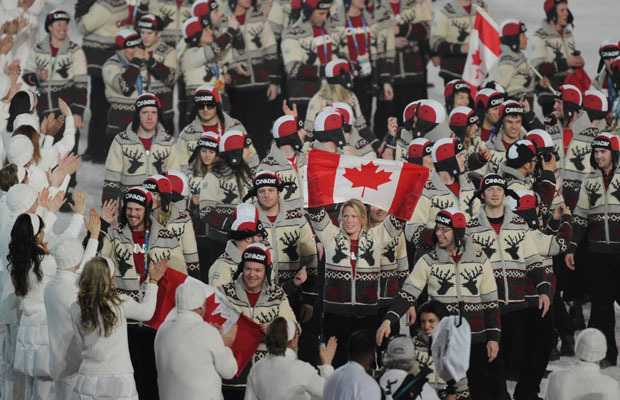 I must say, I really like the apparel that the Canadian athletes wore throughout the Olympics and I had completely fallen in love with Cowichan-inspired sweaters that the athletes sported during the closing ceremony. I had spotted them at The Bay before the Olympics began but couldn't justify the $350 price tag. But now after seeing them in full force on the athletes I'm thinking I need to find a pattern of sorts to knit up my own version!! I'll post photos of my Ravelympics projects throughout the week. For now I need to give my hands a little break. I think I made my tendinitis flare up again with my marathon knitting so I'll be nursing my hands and my severe Olympics withdrawal for a while. 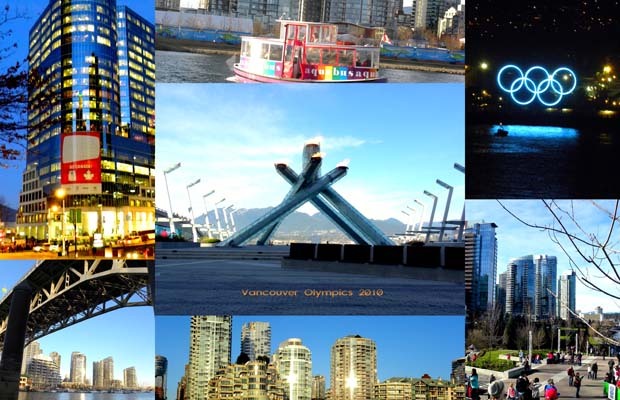 I'm quite proud of how much I had accomplished in 17 days, and am even prouder of Vancouver and Canada. 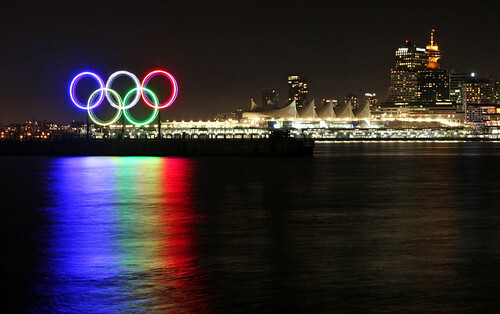 On that note, I leave you with the wonderful and beautiful image of the Olympic rings on the waterfront in Vancouver.